If we can regrow/heal bone, why not teeth? When I posted this question on Facebook last week along with my story, the interaction and reactions were pretty intense, so I realized I need to blog about not only the aftermath of my little experiment, but my plan from the beginning. Note: Erm…I was wrong about that opening line. I was so disappointed in myself when I had a cavity at the dentist’s in January (ok, two…maybe three if you count the one in my wisdom tooth, arg!). My mouth doesn’t hurt at all, and I was sure I had read stories of people healing their cavities with food. The dentist said that the enamel can regrow, sure. Deeper than that (one of mine was, just barely), no way. I’m determined to prove him wrong and get the before-and-after X-rays to prove it! I hate X-rays and avoid them whenever possible, so that tells you how stubborn I’m feeling about not getting them filled yet, much to my husband’s chagrin. With our new lifestyle as at-home entrepreneurs, we are on our own paying for dental work. In January, we were still covered under my husband’s insurance from his corporate job. Think I can deduct the follow up X-rays as a business expense? If I fail, I’ll also have to pay 100% out of pocket to have them filled, so it was a big risk and big decision not to fill them in January when insurance would have paid half. That won’t hold much water if this doesn’t work – and it doesn’t for some people – but I read enough stories, some from people I know personally, to be convinced that it’s worth a try, to trust my body to heal when given the right tools and circumstances. Of course the web is a great resource, but some would say “Dr. Google” is no way to actually make healthcare decisions. High vitamin D (use the coupon KS10 for 10% off!) – get plenty of sunshine and days not in sun supplement with 5,000IU daily of D3. Foods high in healthy fat like coconut oil (use the code STEWARDSHIP for 10% off at that site! ), avocado, olives and fish or cod liver oil. The Vitamin D I take is directly from my doctor, so I trust that’s it’s a good brand. Here’s more about supplementing with Vitamin D.
The butter is Kerrygold from Costco or Tropical Traditions (“summer butter” would be best when available). Yes, I floss, too, once daily. I’m starting with that chart for a few weeks, and then I’ll add in the “do not eat” list. 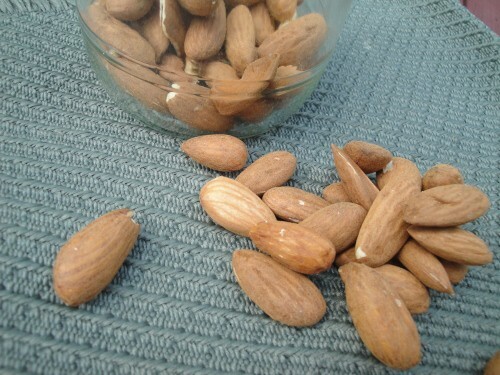 My husband is going to do a Whole 30 during Lent, so I’ll be giving up grains and eating only soaked nuts and seeds (if at all) during that time – plus he’ll be off dairy so I’ll drink his share of raw milk and yogurt. Perfect! Find out what we ate at first, and then as we hit our stride, if you’re interested. Now back to the question of my research, WHY I think I might have gotten these cavities, and why I think I can really heal tooth decay using FOOD! If you’re a visual person, OraWellness has a series of free videos “5 Steps to a Healthy Mouth” that are so good, readers recommended them to ME! Check them out HERE. I haven’t had a kazillion cavities in my life or a long history of rampant tooth decay. In fact, over the last 15 years, dentists have been quite happy with my oral health, except for that one dentist and his money machine. I had two cavities in my childhood and two (small) cavities at the same time in adulthood. The only things dentists like to scowl at me about are my teeth grinding problem and the fact that I’ve kept my wisdom teeth this long. But my general oral health is excellent. None of these are on chewing surfaces if I remember correctly. But as much as I’d like to have a pride trip on my diet, the fact is, there’s been some laziness in both my eating and brushing habits. I make a lot of pumpkin seeds in the fall and am the only one who continues to munch on them – they’re soaked, but I wonder if those thick hulls still have lots of phytic acid! That last one sounds really bad, I know. It’s a no-brainer to take care of yourself and your teeth by making sure you do the basic checkups. Not much excuse when insurance will pay 100%! When we moved 3 years ago, I went back to the dentist we loved once, and the 45-minute drive with two kids and a baby about did me in. Six-ish months later, I went to the next closest “in-network” dentist. There honestly weren’t many around at that time. He shared an office building (but not practice) with the money machine dentist, who I knew I didn’t want to go to again, but I figured I could try the other guy. He knew I was nursing a baby and didn’t want to have the wisdom teeth out anytime soon, and yet he said they HAD to get a visual in there with a full head X-ray to see what might be happening inside the wisdom teeth. Ok, ok…I acquiesced. X-rays done. The oral surgeon who would need to take my wisdom teeth out would only accept those X-rays for 6 months without needing new ones, and insurance only pays for a full head scan every 5 years. I felt like a punch in the gut, like a bait and switch, and I was mad. I did nothing about it at the time and had no intention of being bullied into having my wisdom teeth out while nursing, but when the 6-month postcards came, I called and pulled out of the practice. There was no way I could go back to that guy. I began a search for a more naturally minded dentist, which is extremely difficult to do, even with online connections like I have. It seemed like I would have to drive 45 minutes again, and I just didn’t have the heart to lock that in. I figured we could miss one appointment and go at 12 months, since we were eating well, etc. And life gets away from you. From time to time, I’d have “find dentist! !” on my list, but that undefined target was always the last thing to be tackled. Life got even busier last year with another pregnancy, and I just couldn’t get around to it. I was a little surprised that it had been a full two years, but I was still hopeful that the kids and I would all come away with clean bills of health. Yes, for them, no for me. It was embarrassing, but I deserved it. I’m really good at getting my kids to brush their teeth before bed (except for special, rare occasions when perhaps we’re arriving home from somewhere at 9:30 or 10p and they’ve been sleeping in the car) and have a darn good track record at brushing teeth before school. Considering that most days, my life as a stay-at-home mom is just as unstructured, breakfast can just run into the rest of the day, and before I know it, it’s dinner. At the end of the day, sometimes I have a nursing baby on my lap and I’m the only one awake…so I can’t brush or I’ll wake him up. Sometimes I am working on my computer and falling asleep, and I just have to fall into bed and skip brushing my teeth so I don’t wake myself up. All that mess means that sometimes, to be honest, I bet I didn’t brush at all on a given day. Our eating habits are always in flux, from a Standard American, low-fat diet seven years ago to a soaked/sourdough whole wheat, from scratch big change, to adding raw milk and better meats, then about four years ago going “gluten-light,” which completely changed our grains intake once again. Some of my gluten-free recipes don’t include soaking, so I just don’t. I’m often out of whey for soaked oatmeal and/or end up soaking it for only 6-7 hours because I forget until I’m heading to bed. I’ve been missing some soaked rice opportunities simply because I wasn’t planning ahead. Gluten-free pasta is made of whole grains and not soaked. I add chia seeds to our smoothies – unsoaked – and they’re in some homemade bread and cereal recipes I use. 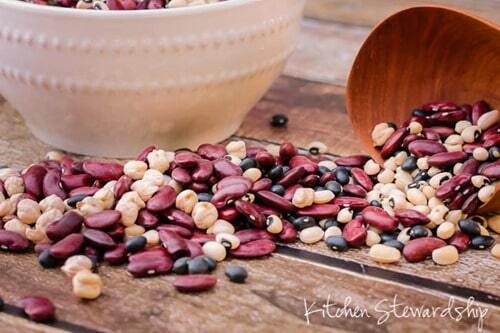 Seeds are supposed to be suuuuuuper high in phytic acid/phytates. I have relied more in the past year on “sort of healthy processed foods” a ton more than previous years: crackers packed with unsoaked whole grains and seeds, bars with decent ingredients, but certainly unsoaked nuts, and after Gabe was born I splurged on “sort of healthy” granola – unsoaked oats are some of the worst phytic acid offenders out there. Man, was it delicious…but it could have killed my oral health. So overall, in the areas of Vitamin D (I’m deficient according to my bloodwork in December, the result likely of living in Michigan and not supplementing properly), Vitamin K, calcium, magnesium, phosphorus, phytic acid, and the darn brushing habit…I have made some poor choices for my teeth lately. I’m hoping I can turn things around by making not only better choices, but giving my teeth a nearly optimal environment to create new tooth enamel and dentin, for at least six weeks! Food eaten has no real impact (on teeth from the inside out, especially healing). Oil pulling is interesting and intriguing, might kill some bacteria, but still shouldn’t be able to actually regrow teeth. Interested in finding out how it went? HERE ARE THE EARLY RESULTS AFTER 3 MONTHS!! Disclosure: Affiliate links in this post to Amazon, Orawellness, Perfect Supplements and more will kick back a commission to the site (but your price doesn’t change!). REALLY?!? Dentists blame poor nutrition (i.e. candy, soda, sugary foods, etc) for causing cavities, but the lack thereof can’t help prevent and even heal cavities? Yes, there are people who, for genetics or other reasons, are predisposed to cavities, and others who are not, but excellent nutrition can certainly make an enormous difference! Katie, look into Black Walnut Tincture too. Some people have seen a difference in cavities with this herbal remedy. I believe the dentist is saying food eaten has no real impact on *healing* cavities. Food certainly does contribute to causing cavities. Once a cavity is deep enough to be into dentin, I’m not sure how food is able to heal at all. I haven’t seen any research on that. Also, I may have missed this while reading (there are girls happily singing and yelling in the background), but was there any mention of flossing? Plaque removal is critical and if the cavities were seen on an xray, they were between the teeth, where flossing is vital and brushing is ineffective. Yes, I do think that’s what the dentist meant – healing – or at least even in causing them from the inside. I’ll have to go back and read that part again to make sure it’s clear. He did say (or I clarified) “from the inside” not on the teeth – definitely dentists think food hurts our teeth, but only as a fodder for bad bacteria to grow and cause dental carries. So I’m now an “unsubscriber” because I find this kind of fool hearty. And honestly, I’m tired of the word “natural.” As if the entire medical field is out to get everyone. Done. 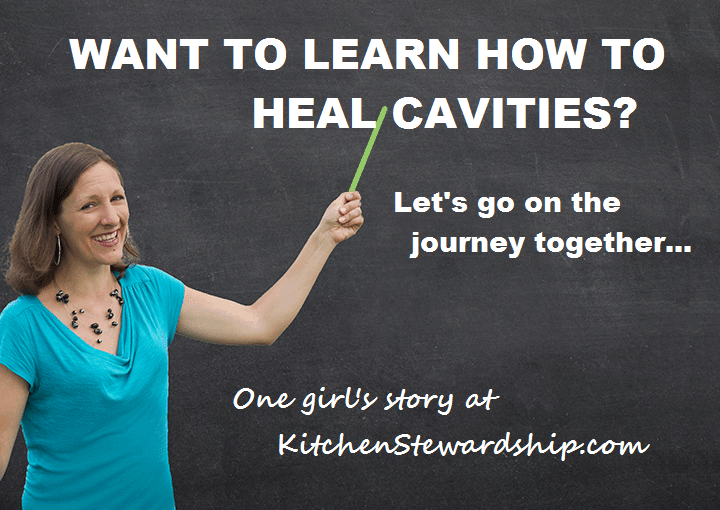 I’m hoping I get to prove you wrong – I’m not the first person to try to heal my cavities with food. It might be foolish to break new ground, but I feel the path has been trodden successfully already. Sorry it bugs you – I didn’t even use the word “natural” in my title or image – it is a bit overdone in general. Have a good one! What IS fool hardy is your attitude. CAVEAT EMPTOR. Maybe you just need to have some more negative experiences and get seriously ill at the hands of modern medicine to learn from other’s experience and not let emotion get in the way. The medical profession is not deliberately out to hurt us, but their so-called “science” IS, because it’s not real science. I am old enough to remember most doctors and dentists – this was in the 1990’s – genuinely believing that you could eat whatever you wanted without it affecting your health. Scepticism is good: unless you only direct it towards so-called “newer” ideas and accept the old as gospel. NOTHING is pure gospel. There is more we DON’T know about the human body than we do know. Don’t squash ideas you know nothing about just because they’re too foreign to you. Our bodies are pure miracle machines and capable of just about anything. I am living proof. But each to their own, so good luck to you, and I mean that without any malice whatsoever. My husband has dealt with cavities all his life and hates going to the dentist. He was having pain due to what we assume were cavities…eve pieces of his teeth breaking off. We added FCLO with butter blend and have been seeing major improvement! No more pain and even regrowth…past fillings/caps have been chipping off because of new tooth growth. I imagine we’d see even better results if we followed more of the suggestions! Beth, how much FCLO does your husband take each day? any real proof its regrowth? I have taken fclo and eaten well for some time and I have a tooth that has a huge filling that the tooth seems to be chipping around. Pregnancy and nursing will definitely increase the odds of cavities. And as gross as it is, I hear you on the somedays I just don’t get around to brushing twice a day! I love lemon in my water and I’m a little worried about my next dental check-up and if the acid plus constant grazing caused any problems. Have you heard about the work of Dr. Nara? Wondering how it compares to other remineralizing programs. Yes, in the same boat! No cavities at all til Baby 1 came along! Haven’t been to the dentist in about a year, and I was pregnant then with Baby 2 and didn’t have x-rays (which I think would have shown more decay activity.) Now carrying Baby 3 and really concerned! We are a gluten free/partially grain free family, and lately I have really cut back on sugar, but my eating habits have been a bit crazy (thank you, 1st Tri “morning” sickness!) Been “Blotting Brush” brushing and taking magnesium and CLO (Swanson Double Strength, not the FCLO but still on the “decent” list from WAPF). I think maybe I’m missing the Butter Oil/ K2 portion of the equation. Does anyone know– do healthy teeth still hold on to stains? Or is that a sign of decay? Same here with my 12 y.o. daughter. She was breastfed until almost 3 y.o. Her permanent front teeth came in with yellow stains. Never drank well water. No cavities. 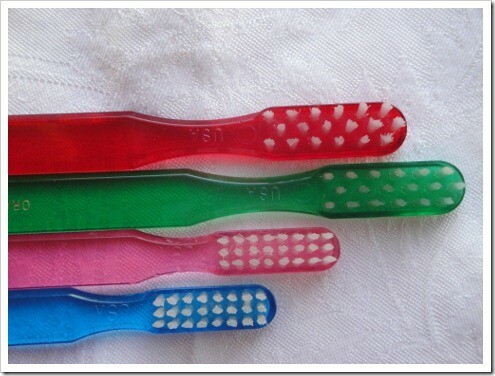 Brushes and eats well (no grains, no sugar). Last time she went to the dentist and previous visits to different ones, I asked about the stains and both of them said it’s genetic, not caused by food (never drank soda or coffee). They offered to give her abrasive treatment to strip away top layer, but we are not doing that. I will try brushing with baking soda and clay to see if it whitens her teeth. Hope your journey to healing your teeth is successful. I hadn’t been to the dentist in 14 years, and went last year. They found 2 small cavities, after having 4 children. I have many fillings from when I was a child. My Mom didn’t feed me well (lots of soda and sugar), but after I became a teenager I took care of my teeth and haven’t had any problems. I think sometimes our teeth’s health is due to the genetic we inherited. But I am all for trying to make them better. 🙂 Good luck. My young boys had bad staining at their last cleaning and the dentist and I were wracking our brains to think of why – they don’t drink coffee or tea. Finally we figured out it was their daily bowl of frozen blueberries! She got the stains off. Just want to encourage you to keep up the good work. Yes, this is a little edgy, but I find it fascinating and can’t wait to hear how it turns out. I don’t think you are saying the whole medical field is out to get us, but there truly are some medical minds that are clamped shut. Good luck with it and keep us posted! Have you watched the Orawellness videos? I’ve been working on my teeth and found them really informative. I’ve read Cure Tooth Decay but it’s so overwhelming! I lost several teeth on steroid treatment (for secondary pituitary failure). I haven’t got dentures yet because I am convinced my body can grow new teeth. Any ideas about how to do that – so not just healing a cavity, but getting your body to replace entire teeth? Did you know that taking magnesium orally only allows your body to absorb 5% of the intake? And is a natural purgative… so will help move bowels whether you are seeking that outcome or not? Soaking your feet (or your whole self) in an Epsom salt bath is super relaxing and allows your body to absorb as much magnesium as it needs through the most effective mechanism. Thanks for that info, yes, I discovered the laxative action of SOME Magnesium supplements the hard way, lol, but have never had any adverse effects with Magnesium Aspartate and/or Magnesium Chelate. It’s the Magnesium Orotate that seems to be the problem one for me. Also, you can take and absorb tonnes of magnesium (and the relative amount of calcium) but without enough Boron it won’t do you much good. So I use Boric Acid as a mouthwash (kills all bacteria and brightens teeth as an added bonus) as you absorb enough Boron via the lining of your mouth. Dear Katie: I CONGRATULATE you for having the courage to write about this topic. You are my kind of heroine. I’m certain your experiment will turn out well. God bless you. Irini, could you please give more specifics on your bath regime for muscle cramps? I need this! So tired of getting up multiple times at night to walk off or rub down cramps in areas I was unaware muscles existed. Soaking my feet in magnesium oil helps — wondering what else I could do. 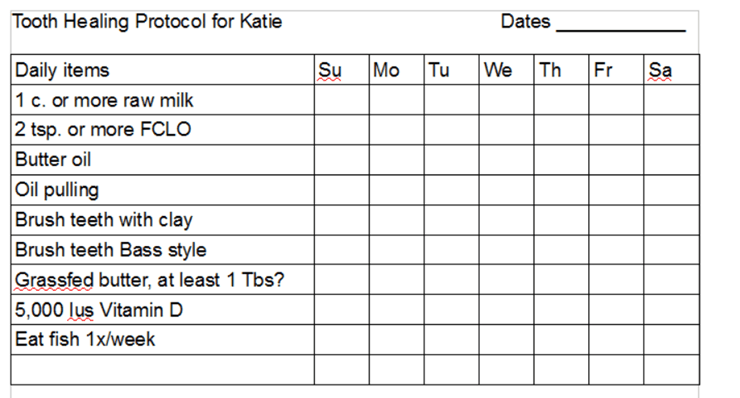 Katie, I love your protocol and effort to heal you teeth. I too want to fix my teeth. After doing apple cider vinegar and honey tea for several months, I discovered I damaged 23 teeth. Yes, I said 23! I was in shock and denial for over a year. . . had to have 2 teeth pulled. Still haven’t gone beyond that (money and insurance issues.) I have written your protocol down and will also attempt to use Lent to get my teeth in order. Thanks! My mother in law is attempting to remineralize her teeth, as she has some “watch ” spots, in her words! I am not sure what her exact plan is. I’ve heard some positive things about bone broth for teeth. In fact, I am reading Nourishing Broth right now, and it sounds like it is a vital part of these tooth decay healing process. Thankfully, I’ve never had a cavity! But I can’t say it wouldn’t happen. I’ve gotten a little lazier in the brushing area since I’ve had two young kids, but I always attempt to brush twice a day. Flossing… Well, not so much, but I think you’ve inspired me to redouble my efforts 🙂 Hope your plan works! It’s worth a shot! I was going to say, you should cut yourself some slack, Katie! 🙂 you just had a baby! As well as have 3 other children…. And you still manage to eat healthier than 99 percent of the American population! 🙂 Eating a real food diet takes a lot of work (especially since most of us don’t live on farms or as close to the earth anymore!) and sometimes we go through seasons in our life when we have to cut corners a little bit. it doesn’t mean you still aren’t making healthy choices for your family. Just wanted to mention that! You are an inspiration to many of us who are trying to move towards a healthier lifestyle.I check out your website every day! I too struggle with brushing often enough after I have had a baby. What has helped this time around is to put a toothbrush and toothpaste in my downstairs powder room, which is right off of my kitchen. That way if I don’t get a chance to brush before coming down for the day I can pop in there at some point in the morning and do it. And at night sometimes I will brush in there before sitting down to nurse the baby in case she falls asleep on me. Don’t know if that tip applies to you at all, but wanted to mention it! Good luck, Katie! I think half the battle is mind over matter (good food is paramount of course). If you think it can happen, it can. If you think it won’t, it never will! I healed three of my son’s four cavities a few years back. I got one filled and then I decided to not to fill the other three. Instead, I worked on his nutrition and gave him cod liver oil daily. At the six month dental checkup, his cavities had stopped getting any larger. When my husband took him to the year appointment, the dentist was amazed that they were gone. I think my husband was surprised, too! My husband thought it was great, though, and the dentist asked him lots of questions about what we were doing. My daughter then got a few cavities and we have been doing the same protocol that we used for my son. The one difference is that we have added a supplement called Biodent that my chiropractor gave us. It is supposed to help rebuild the dentin. We went to her six month check up recently, and the dentist said her cavities were healing. Unfortunately, I have not had much success with my own teeth, but I am very thankful that it works for my kids. I’m glad to hear about you healing your son’s cavities with Biodent. My dad was a chiropractor and sold Standard Process vitamins, but must not have known about Biodent when we were young because my sisters and I have our share of fillings! My sister healed her son’s cavities using it, and now I’m working on my son’s teeth with it also. I’ll have to try adding cod liver oil too. Thanks for that tip! Such great timing! I just went to the dentist. I dread it because I ALWAYS have a cavity, plaque, receding gums, etc. no matter what my oral hygiene habits are. When I went in this time, they were praising me on how much better my teeth are (receding went from 5 to 4mm, no cavities) and asked me what I’ve done differently and I couldn’t think of what I’ve done differently. On my way back home, it dawned on me that I’ve been avoiding highly processed food for about 7 months now. I follow so many of the habits listed in your article. Totally amazing how that transformation occurred! LOVE love love your story, Ella! Especially that it happened without you really trying to focus on your *oral* health specifically – what a testament to real, whole foods! Lol! I don’t think my entire comment saved:) basically, I’m truly excited to read this and follow your progress for encouragement:) good luck! Ugh, so frustrating Ashley! I have read on Kelly the Kitchen Kop’s blog about her oldest son’s fluoridosis (is that what it’s called I think, the gray teeth? ), so she might be a resource for you too. I hope the book works wonders for the both of us!! Thank you! I will check her blog out! I forgot to mention that I’ve been oil pulling lately and my teeth are noticeably whiter, can’t tell if it’s my wishful imagination though?! ;) thank you for the info! I would love to see your meal plans! And, what do you know about oil pulling when one has amalgam fillings? I have read mixed thoughts on it. Thanks! Looking forward to following this! I have read that it will not loosen a filling/crown/cap that has been placed correctly. However if there is further decay under/behind it then it could loosen when you start working on that decay with oil pulling. I have not read enough on mercury to understand fully if I should oil pull (I have two kinds of fillings). I want to try but am nervous. And I would see if Dr. Bruce Fife has anything to say about it anywhere online – he is the authority! I know sesame seeds are super duper high in phytic acid, so I’m staying away from tahini for at least 6 weeks, personally – but I haven’t looked it up specifically in the Nagel book. Thanks a lot! I used to eat a tahini-honey-cocoa spread everyday and i didnt know about the phytic acid (i thought it was healthy) and now i replaced it with cows butter-honey-turmeric spread which is very tasty! So i could stay away 6 weeks and then instead of my daily breakfast it could be just a treat! I had a cavity for the first time in decades after I started drinking kombucha, and I wonder if there was a connection. I haven’t given up kombucha, but I’ve started rinsing my mouth with water after drinking it. This link has info: http://www.orawellness.com/blog/how-to-drink-kombucha-and-not-destroy-your-teeth/ . This is exactly what I’ve been reading about recently. I make my own kombucha and recently went to the dentist after (mumble-mumble) years and had decay. No plaque build up at all–oral hygiene was deemed excellent (I have been oil pulling for a year or so and it’s a huge difference!) So if no plaque, leads me to look at acids. I drink coffee and kombucha. Now will wait 30 min to brush per that article and see how that helps. I also graze all day. According to what I’ve read, some, but not all, kombucha contains Lactobacillus. I first read in a book titled “How to Become Dentally Self-Sufficient,” by Dr. Robert O. Nara and Steven A. Mariner, about Lactobacillus and other bacteria in the saliva having an effect on the propensity to develop cavities. I found an article in a 1938 (!) issue of the “American Journal of Public Health” reporting on a connection between Lactobacillus acidophilus and dental caries: http://www.ncbi.nlm.nih.gov/pmc/articles/PMC1529128/pdf/amjphnation01008-0073.pdf . what about healing gum recession? Ever since I’ve had my third child I seem to be having rapid gum recession on my front for teeth on the top. With the FCLO and re-mineralization toothpastes help Restore gums, or should I be looking at a different kind of regimen? I felt like I was reading my own story while reading this article! I am on the same journey and just found a biological dentist that I am switching too as my previous dentist said “some people just have bad luck” after he found a cavity. I’m pretty certain 3 kids later and all the breastfeeding has impacted my dental health. I’m on a mission too to prove that old dentist wrong. I already follow most of your plan but learned a couple new things too! Thanks so much for sharing your story. I’ll be very interested to see how things work out for you! I’m eager to see your success, Katie! I’ve been trying to heal my kids’ cavity problem without success yet, but I feel like the dentists haven’t given us a chance to see it work. On Medicaid we were forced to fill cavities when a hygienist reported me for child neglect for not filling. (But we’d been eating a WAPF diet and taking CLO for a few years, so I suppose that theoretically I’d already been doing what would heal them.) One new thing I recently started is homeopathic remedies — calcarea phosphorica and calcarea flourica. I read on a WAPF article that a mom did that for her kid and an ongoing cavity problem was cured. You dilute a dose of each in water and have a spoonful every day. I’m hoping for a good report this spring. Not that you want another thing to look into, though, I guess! You already have lots of ideas! GUess what!!! I just went to the dentist for the first time in many, many years — the first time since the diet change — and the dentist said I have such wonderfully strong teeth with no sign of any decay or soft spots. And I grew up always having cavities!! It’s so tough that for me soaking whole grains and not eating any white flour for 5 years seems to have improved my teeth. But I’ve been wondering if the whole grains are the culprit for my kids. Nothing is simple or easy to decipher! But I was completely astonished by the dentist’s words. 🙂 What I do have is years of tartar build up that’s become early periodontal disease. I bought the Orawellness healthy mouth blend and their bass brush, so I hope next time the gum deisease will be gone. That is AWESOME news Charlotte! I wish you could have shown the CPS people my next article in this series…coming today! Your kids’ cavities were probably not properly diagnosed if the dentist only had one X-ray…but I’m super happy for you and your strong teeth!! I was waiting until my last dental appointment to chime in. 9 months ago I had 3 cavities! Eek! My dentist only sees me usually once a year because my teeth are usually good and the hygienist has trouble finding stuff to scrape away (even when I went two years without seeing her!) So, yes, definitely a dent to my ego. BUT….I had been consuming more sugar and more refined flours as I switched jobs and started working crazy hours. Like you, I did a lot of reading too, and made a few small changes right away. But for the last two months I have gone entirely sugar free on the advice of my naturopath (no honey, no maple syrup, no sweet fruits like bananas or dried fruits) as well as gluten-free. I also started brushing with bentonite clay toothpaste and I make my own herbal mouthwash on the advice of an herbalist who cured her gum disease that way. And this visit my dentist says – he can’t find a thing! 🙂 So, no, I don’t think you are crazy. (as a side note I rarely soak anything, eat a lot of legumes, don’t drink milk, and can’t afford fclo….so those weren’t contributing factors, at least in my case.) I wish you similar success! Herbal mouthwash, hmmm, where could I get a recipe for that? We live in the same area you do – can I ask what dentist you go to – we have been searching for one in the area that follows Weston price. Thank you! I don’t think you’re crazy and I want to see your results. Please post them if it works or not. I think we need to try something like the plans you outlined also. Several years ago my eldest had a cavity that healed. It took us 2 long years for it to work, but on the other hand she was going through puberty at the same time. I loved watching her beautiful, wide adult face developing. 6 months ago my 3rd child was diagnosed with a cavity. We’ve been vigilant with our FCLO and butter again, but when she went to the dentist this morning she found no improvement and now has 2 cavities. Hi! Your story is so interesting… I’m hoping to implement some of those same guidelines. Have you written any progress posts? I am 22 years old and have had multiple cavities and two root canals thus far. I know, sad day. I went into the dentist for a cleaning after three years…-and I have four new cavities. Well, it’s time to try all natural remedies like this! I hope the results show improvement! Wish me luck! Is there an update for this? Be Your Own Doctor, by Rachel Weaver is great and you will get a lot of info that is not your usual list of “go-to’s” like the WAPF’ers (I am one of them). I agree with some other posts about pregnancy being hard on the body and cavities come out. It happened to me after each pregnancy even with trying to eat healthy (soaked grains, CLO, raw milk, etc.). Rachel Weaver says it’s still not enough calcium during pregnancy. Also Black Walnut tincture is FANTASTIC for tooth sensitivity. It will immediately stop any pain. It’s amazing. 2 years ago a friend of mine, her daughter had a cavity, and used black walnut to heal it. Yes, gone. Rachel Weaver says that it will heal cavities in children and stop them with adults (but not quite heal). I’m currently trying to heal a spot as a filling fell out 2 months ago. So, I am increasing my CLO and using a lot of black walnut tea, tincture and even herbal powders recommended in her book.